Hoverboards have become widely popular over the past few years. Thanks to these self-balancing scooters, getting around town has never been easier or more fun. Before getting your legs on one, make sure to take our list of 16 best hoverboard brands into consideration. After their rapidly gained fame, hoverboards have become the main topic of concern for manufacturers and users. The issue always comes down to questions of safety, battery life, speed, unique features and, of course, price. In order to pick out the board that will serve you right, it is crucial to understand the difference between different hoverboards. 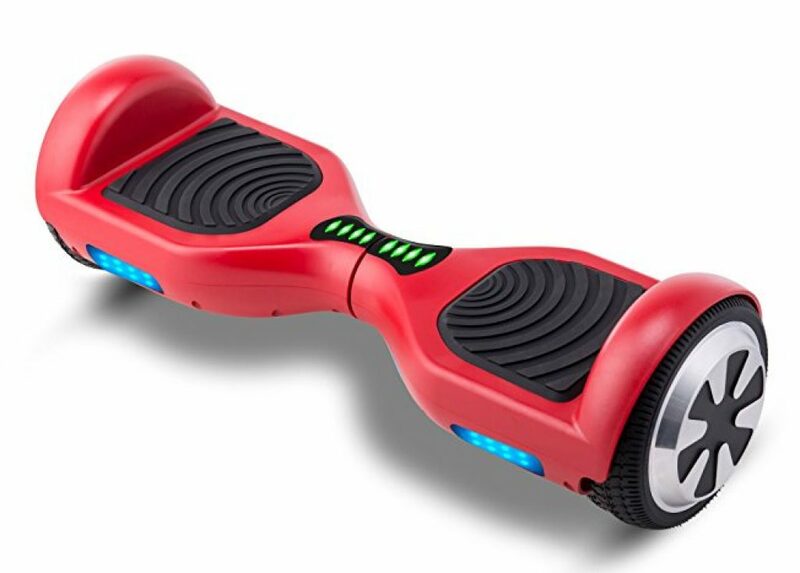 The hoverboards currently available on the market guarantee safety and ease of use. However, not all of them are the same. Due to the popularity of these self-balancing scooters, the supply is over the top, and one can easily get lost when in search for the best model. Prior to making your decision, read the reviews we compiled for you. HALO has been on the market since 2005 and has continuously improved. This brand is focused on producing boards that are innovative, creative, efficient, and effective. 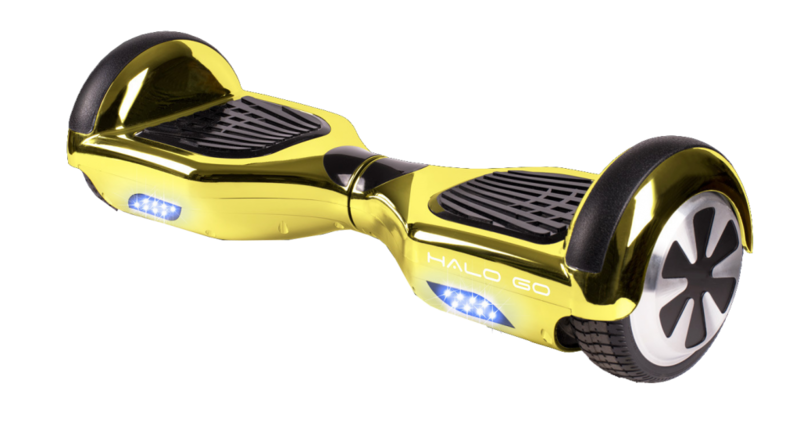 The GO hoverboard by Halo is no exception. The GO hoverboard underwent numerous electrical and safety tests and had no trouble passing them all. This hoverboard uses LG batteries which is a guarantee for maximum longevity and can reach a power of 500 Watts. The maximum speed of the HALO GO is 9 MPH with 8 miles ride range. The board weighs roughly 22 lbs, so if you are stuck in a ‘traffic jam’ you won’t have difficulties carrying it. The HALO GO comes with Bluetooth, an app, LED lights, and an impact resistant shell. It is the perfect choice for beginners and lightly experienced riders, as well as professionals who don’t mind spending few extra bucks on the right ride. It is the best rated hoverboard out there. However, the cost shouldn’t stop you from getting this hoverboard; check out Amazon deals, for example, and you’re going to love the discounts! The HALO ROVER hoverboard takes spot number two in our directory. Similar to the above-mentioned model, HALO hoverboards shows high reliability in terms of safety and ease of use. As well as the HALO GO, this hoverboard also comes with a certified LG battery that enables higher power supply of 800 Watts. The ROVER weighs 32 pounds and can carry a max load of up to 220 lbs. It is designed to reach up to 10 miles per one charge. The extensive line up of features such as Bluetooth, an app, LED lights, and non-inflatable tires combined with the design that can take on any terrain, rank the ROVER highest in many best hoverboard reviews. In spite of being on the pricier side, this hoverboard compensates well with its top-notch features and its extremely powerful and durable design. A pioneer in youth recreational products, Razor launched its original A model scooter nearly two decades ago. A leader in modern categories of ride-ons even today, this brand has introduced a plethora of best-selling hoverboards, the latest of which is the Hovertrax 2.0. The Hovertrax 2.0 is a patented hoverboard model by Razor designed to meet and surpass the industry’s highest safety standards. It comes with an easily changeable, authentic LG battery that grants motor power of 350 Watts which can run for 60 minutes with no interruptions whatsoever at a maximum speed of 8 MPH. The Hovertrax 2.0 is built with exclusive EverBalance technology which adds to its efficiency, but doesn’t add to its weight; this hoverboard weighs no more than 22 pounds. 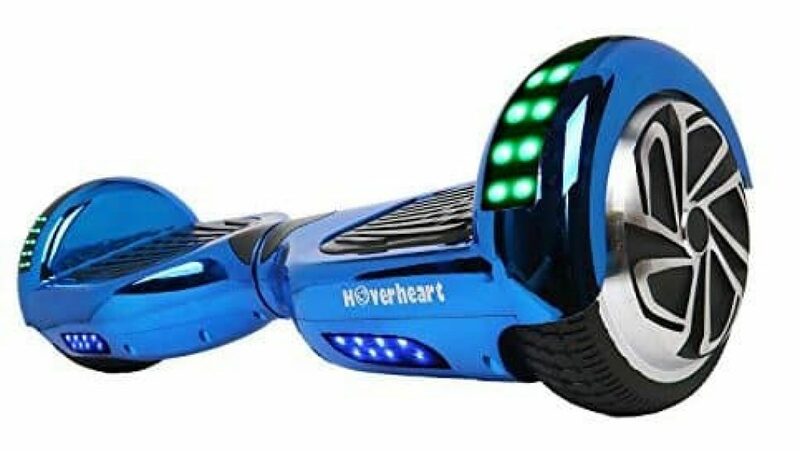 It features front blue LED lights and unbreakable polymer frame which makes it the best buy hoverboard for beginners who might need damage control. The Hovertrax 2.0 is designed for anyone aged 8 or older, and it comes at a price that even an eight-year-old can afford. After a detailed view on the Hovertrax 2.0, it’s time to take a look at its ancestor – the Hovertrax 1.5. Both of these models do their brand justice and are among the main reasons for Razor’s reputation as the best hoverboard brand. Hovertrax 1.5 doesn’t differ much from the Hovertrax 2.0. While the Hovertrax 2.0 can reach a speed of 8 MPH, Hovertrax 1.5 can’t do more than 6 MPH and has an average run time of up to 45 minutes of continuous use, as opposed to the 2.0 which can run for an hour. This model also allows you to switch between training and normal mode, making it the perfect choice for beginners and pro riders. It features a shatter-resistant polymer frame and body, and front blue LED lights. The most noticeable difference between the Hovertrax 1.5 and 2.0 is its size and weight; Hovertrax 1.5 comes smaller, but lighter too. This hoverboard delivers never-seen-before stability and self-balancing properties. Hovertrax 1.5 is the best hoverboard under 300 that will give you the sensation of riding a million dollar ride. Being the market leader as the #1 brand of e-rides, the team behind Swagtron is all about innovations, fun rides, and high-quality products. This brand is the first hoverboard brand that comes with the certified Sentry Shield battery pack and upgraded safety, which puts Swagtron high on the list as the best hoverboard brand. 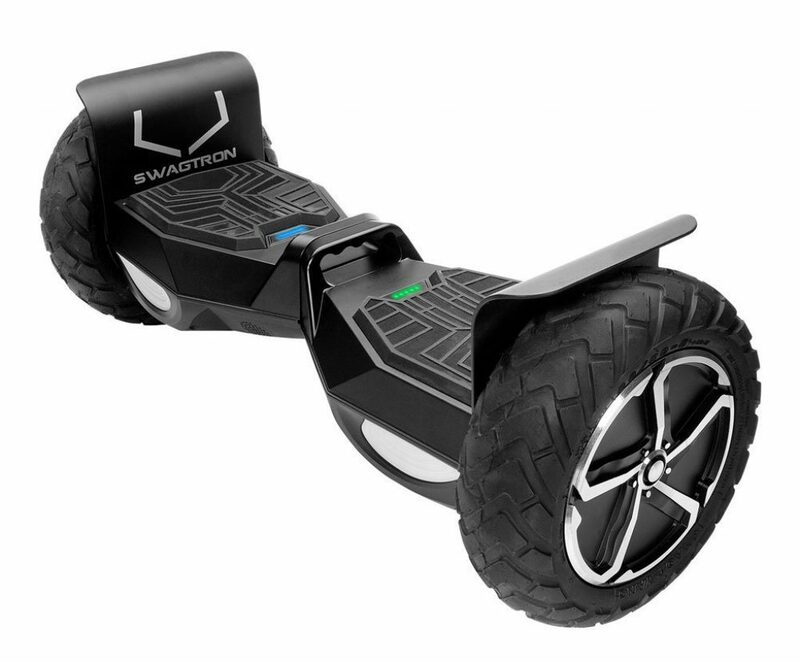 Get on your Swagtron and turn your swag on; the Swagtron T1 promises the coolest ride. It comes with some killer features such as speakers, carved aluminum wheels, high-durability shell, rubber guards and what not. Safety comes first, and the new Safe Stop Technology of the Swagtron T1 is here to take all the safety precautions. The Swagtron T1 weighs no more than 22 lbs making it super flexible if you ever need to carry it. Motor power of 250 Watts enables 7-12 miles ride range per charge. This hoverboard is suitable for beginners as it can be used in a learning mode, as well as more experienced riders who are up to having some fun. 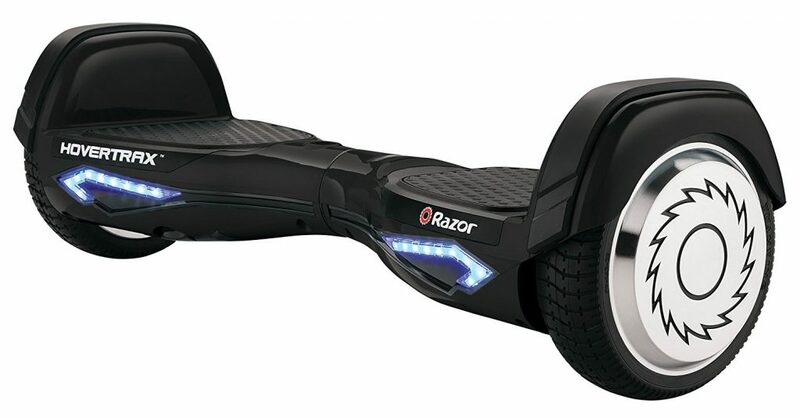 Swagtron’s T1 price tag fits within everyone’s budget, but you can bring the price of this awesome hoverboard to an even lower point by relying on eBay coupons and discounts. Another one from the T series by Swagtron, Swagtron T6 won in the category of best hoverboards 2017. Swagtron T6 is the first hoverboard that can handle up to 420 lbs which implies that its suitability knows no limits, regardless of user’s weight or size. With a motor power of 350 Watts, maximum ride range of 12 miles, and capability to reach a speed of 12 MPH, the Swagtron T6 is one truly powerful self-balancing scooter. As well as the Swagtron T1, Swagtron T6 also comes with speakers, durable shell, rubber guards, carved aluminum wheels and multi-level LED movement indicators. While the T1 model doesn’t feature Bluetooth speakers nor iOS and Android app, Swagtron made sure to include these extra features in the T6. The Swagtron T6 weighs 30.5 lbs, and has a tire size of 10”; it is one of the biggest hoverboards out there which makes it indestructible on all terrains. Although on the pricier side, you can be assured that you will get your money’s worth when opting for Swagtron T6. EPIKGO is all about pushing the boundaries. 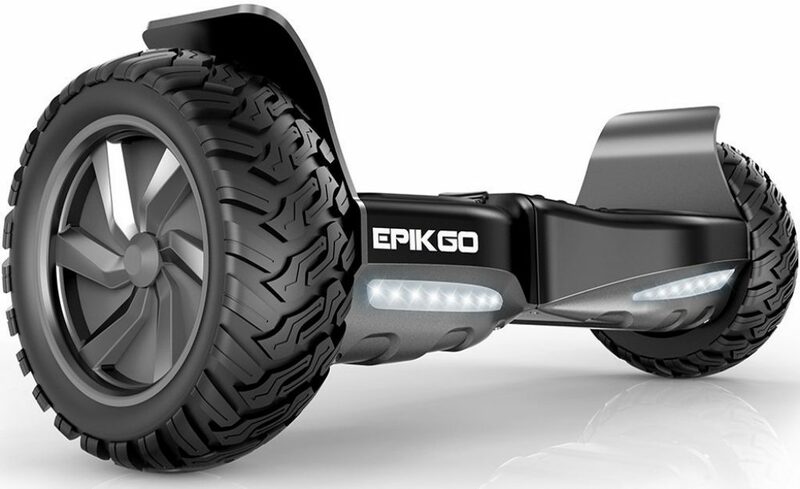 EPIKGO’s take on manufacturing hoverboards resulted in a big plus for the hoverboard industry. Their hoverboards offer a reliable way to get around in regards to safety and efficiency. The EPIKGO line of products promises high-quality self-balancing scooters featuring the latest technology that work in every environment. EPIKGO all-terrain hoverboard passed 150+ tests, so you can be assured that you are safe from harm when riding it. With meticulous attention paid to stability, control, and comfort, the EPIKGO is possibly the best hoverboard for kids. It comes with 400 Watts dual motors which make this self-balancing scooter extremely powerful against slopes as steep as 18 degrees. With a run time of an hour and over 10 miles range on a single charge, EPIKGO all-terrain hoverboard is one mighty beast. Thanks to the solid rubber tires and water resistance properties, as well as the fact that this balance board is larger than other boards, it is fair to say that it can handle any terrain and maneuver through grass, mud or sand. It is best suitable for anyone aged 13 years or over. You may need to dig deeper into your pocket, but this hoverboard is worth every penny. When opting for EPIKGO hoverboards, you are choosing the perfect combination of technology, innovation, and impeccable style. This model is a staple of nearly every best hoverboard review. 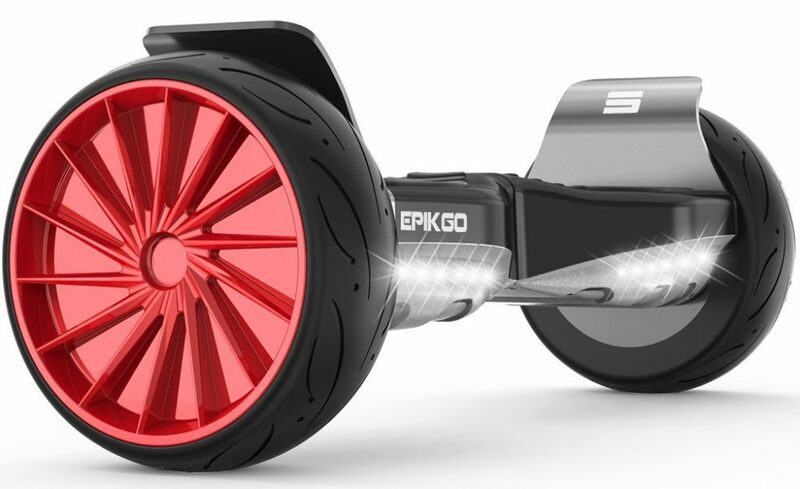 One of the latest additions to EPIKOGO’s hoverboards collection is the majestic EPIKGO Sport Plus. EPIKGO Sport Plus, as well as the EPIKGO all-terrain hoverboard, underwent 150+ safety tests as a guarantee for no potential fire hazards. 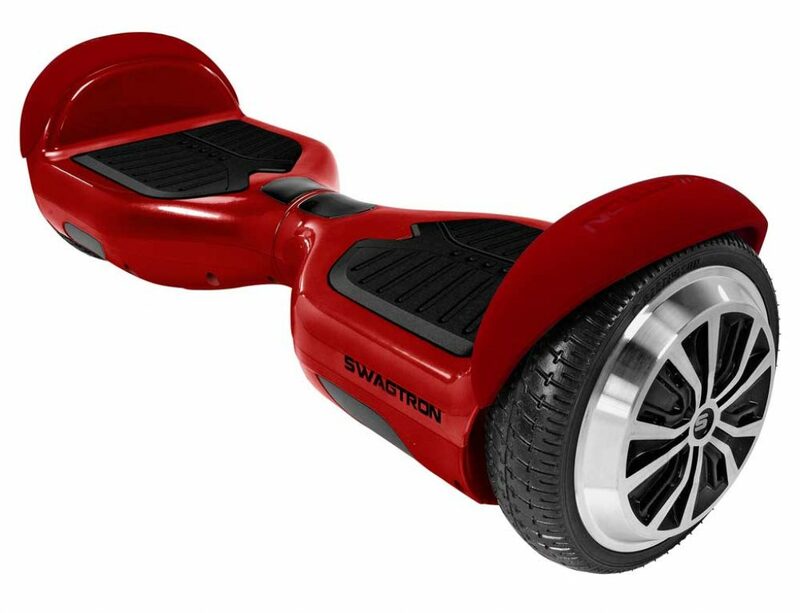 It is made with high-quality materials and body components making this hoverboard extremely tough, durable, and safe. The same 400 Watts dual motors as in the previous model by EPIKGO, vouch for safe movement across any type of fields at a maximum speed of 12 MPH. Even though this hoverboard is larger than other self-balancing boards, it doesn’t weigh more than 33 lbs and can carry a maximum load of 200lbs. It comes with fast-charging technology, Bluetooth speakers, LED lights, and a bunch of other features any rider is going to enjoy. The EPIKGO Sport Plus can operate in water as it is entirely water resistant. This model was designed with adults in mind, both in terms of power and money. Another hoverboard brand that you can’t miss checking out is OTTO. All hoverboards by OTTO are designed for safe use, maximum riding satisfaction and have the coolest appearance. OTTO has a worldwide spread customer base, all because of their proven quality and killer technology. OTTO Hoverboard 6.5” has a reputation for being the best hoverboard under 200. The self-balancing scooter is upgraded with features that elevate the functionality of the OTTO Hoverboard 6.5” to the next level. No safety regulations are abused, as this hoverboard comes with overheat protection, low battery protection, low weight protection, over-speeding protection and slope protection. The OTTO Hoverboard 6.5” is powered by dual 250 Watts motors and can reach up to 10 miles range on a single charge. It delivers an incredibly steady and smooth ride which makes it safe enough for beginners too. Extra features like Bluetooth speakers for iOS and Android, as well as the awesome LED lights, are just reasons why many riders opted for OTTO hoverboard 6.5”. Kids, students, and adults are all happy to take a ride on this hoverboard. Segway is a brand with a worldwide presence, known for their commercial-grade, electric, self-balancing personal transportation devices, one of which is the hoverboard. With a history of over 15 years, Segway earned the trust of million satisfied customers and is thus an inevitable part of many best hoverboard reviews. The Segway MiniPRO meets the high standards of fire and electrical safety. It is powered by Ninebot technology, built to easily traverse through a variety of indoor and outdoor terrains and weather conditions. 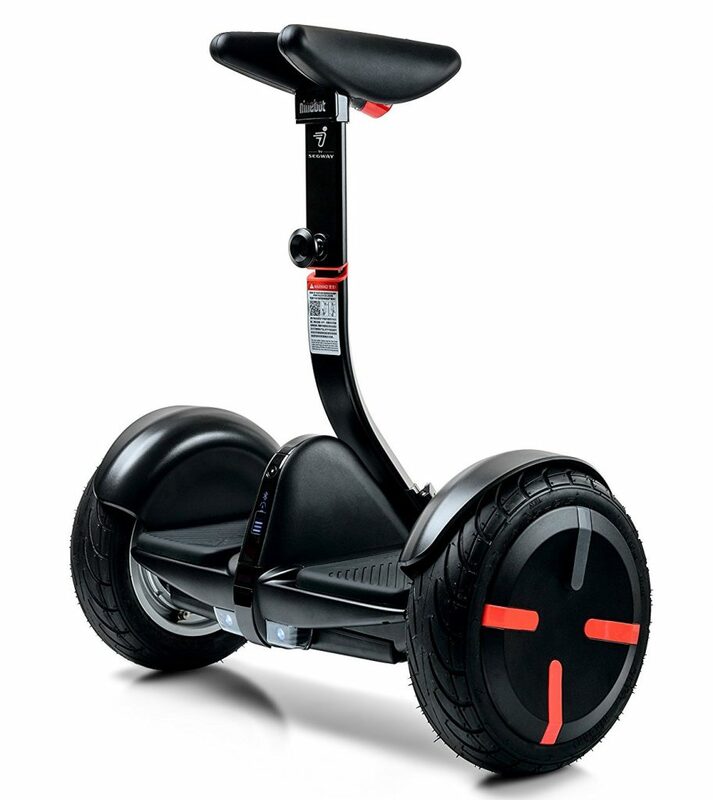 Thanks to the 800 Watts dual motor, Segway MiniPRO is engineered to adapt to road obstacles. It reaches up to 10 MPH and can travel distances up to 14 miles per single charge. The padded knee control bar and adjustable height feature enable riders to maneuver the board effortlessly. The knee control bar can be easily detached if you ever see the need to store the hoverboard in small spaces, and it is so lightweight that you can carry it in your hands. 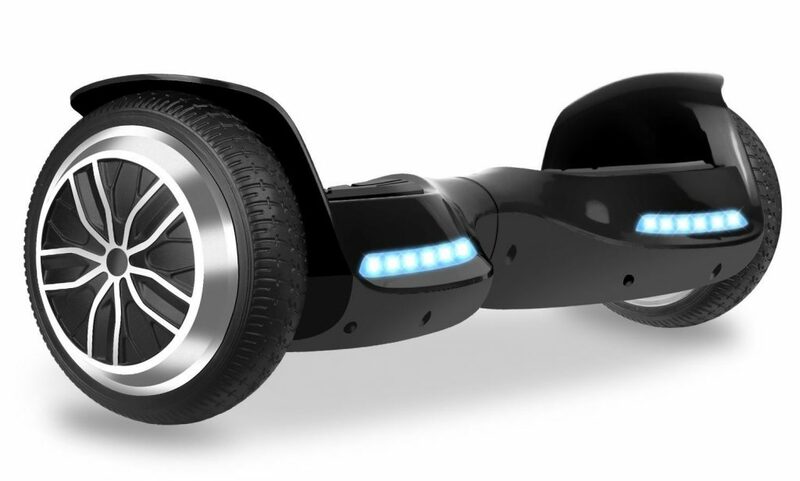 This self-balancing scooter comes with phone app control and anti-theft alarm, customizable LED lights, vehicle diagnostics and firmware updates. The team at SagaPlay works on developing the best technology in the balance board industry that money can buy while keeping the essentials that every hoverboard must feature – high safety standards and satisfactory rider experience. 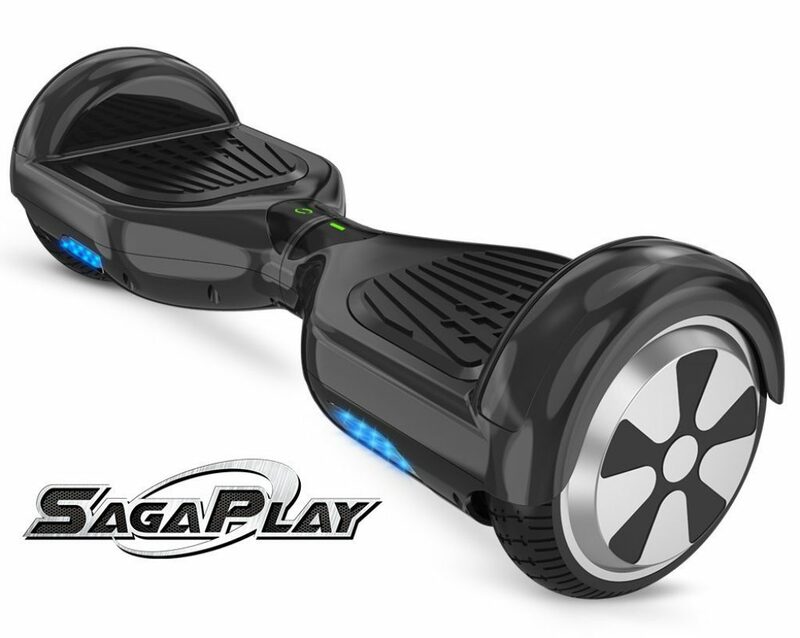 The SagaPlay F1 comes with dual 250 Watts motors which enable climbing steeps slopes. The battery can last over one hour and can exceed speeds of 10 MPH, even though it is meant to go no faster than 9 miles per hour. Featuring LED battery indicator, non-slip foot pedals and solid rubber tires, the mobility you can experience with the SagaPlay F1 knows no limits. What makes this model outshine other hoverboards is the possibility to go forward, backward, and even spin! Taken all things into consideration, the verdict is obvious: SagaPlay F1 comes with some of the best properties for a price that won’t dry out your bank account, making this hoverboard the best price hoverboard out there. It is best suitable for people aged between 16 to 60. Hoverboards by HOVERZON, whether HOVERZONE S or HOVERZON XLS type, are using certified batteries with the latest HOVERZON Aegis Armor battery protection. New dual independent motor and gear stabilization, as well as new, specially designed ABS material casing, improve the stability and durability of the HOVERZON hoverboards. HOVERZON S has two modes – practice or pro mode – intended for beginners and pro riders who love the convenience of the hoverboards. This makes it one of the best hoverboards when it comes to versatility. The dual 250 Watt motors can reach up to 8 MPH, and on a single battery charge the HOVERZON S can travel up to 12 miles before needing to recharge. Thanks to the two gyroscopic motors, you can control the hoverboard by shifting your body weight thus ensuring a dynamic equilibrium. The HOVERZON S is fully equipped with all the necessary features and a few extras like LED headlights, standard battery indicators, rubber bumpers and sleek aluminum wheels. It weighs approximately 22 lbs with a carrying capacity of up to 220 lbs. This hoverboard model is suitable for anyone of the age of 13 or over. MegaWheels focus of interest lies in the idea to revolutionize modern personal transportation. This brand is an expert supplier of hoverboards since 2014, and they continuously strive to grow by developing some top-notch products and earning the respects of customers worldwide. 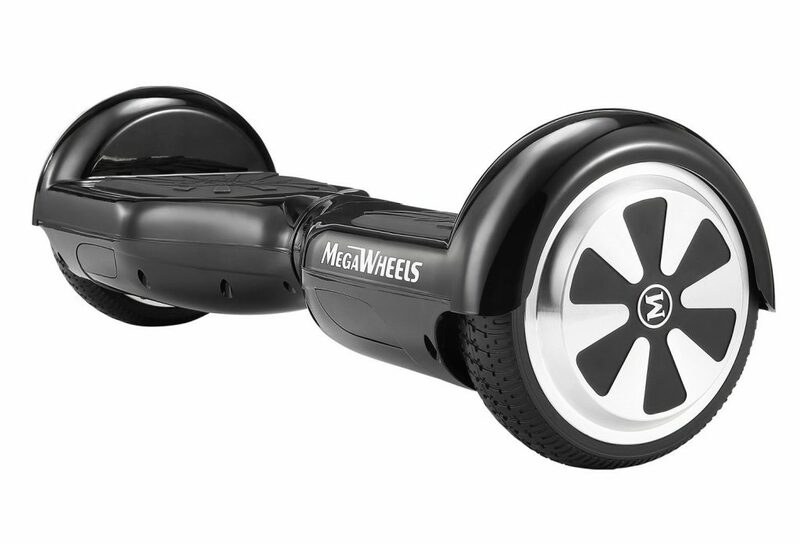 MegaWheels hoverboard is one of the most popular budget hoverboards currently available on the market. If you go through any best hoverboard review, you will conclude that the MegaWheels hoverboard may come cheaper than other self-balancing boards, but doesn’t lack anything in regards to quality, efficiency or special features. Powered by two 250 Watts motors, it can reach a top speed of 7 MPH with a ride range of maximum 12 miles. The MegaWheels hoverboard weighs approximately 26.3 lbs and can carry a load of something over 260 lbs. Another pro that must be mentioned is the comfort of the ride: MegaWheels can deal with inclines and rough ground seemingly effortless. The MegaWheels hoverboard is perfect for kids or beginners as it doesn’t have a high speed nor is too pricey. Hoverheart is another hoverboard brand frequently featured in best hoverboard reviews that offers high-tech, quality, and features-rich hoverboards at a low price tag. Hoverheart hoverboard delivers the best appearance, special features, and technology. This hoverboard has been a subject of the regular safety test to earn full certification. The wheels are coated with solid rubber tires able to handle a variety of surfaces – on and off road. The Bluetooth feature of this model is one of the reasons why it’s ahead of the competition. Dual 200 Watts motors give plenty of power to the wheels, while two to three hours is just enough to fully charge this hoverboard and it can deliver up to 12 miles ride range. It weighs approximately 25.4 pounds and can carry a max load of 220 lbs. Hoverheart’s unique design makes this hoverboard number one choice for many riders. Moreover, the brilliant LED lights this self-balancing scooter comes with are a big plus in terms of appearance and night vision too. If you are looking for the best cheap hoverboard, VEEKO is your to-go hoverboard brand. This hoverboard brand always scores high among riders, as any hoverboard by VEEKO features everything a self-balancing scooter needs and more – all for a price that won’t dry out your budget. 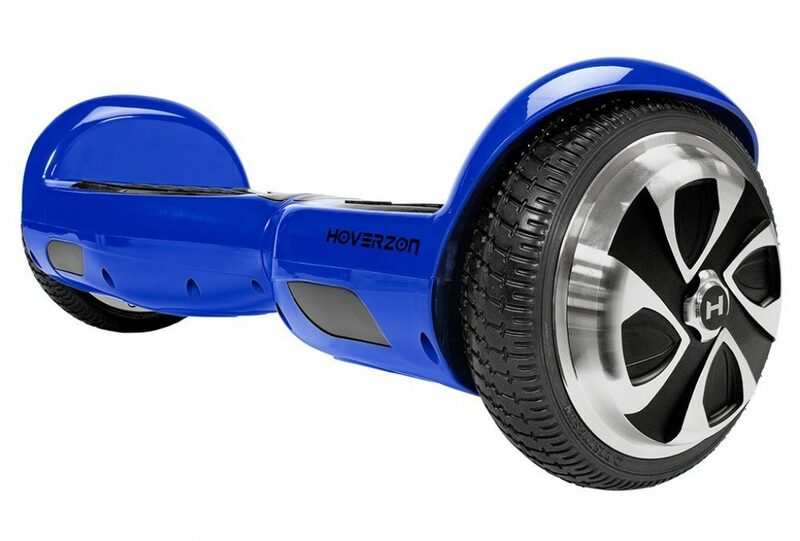 Although this hoverboard comes at the most competitive price, you can redeem a Walmart coupon, for instance, to reduce the price even more. VEEKO hoverboard features overheat protection, low battery protection, low weight protection, speeding protection, and on top of that – slope protection for extra security. It is one of the most convenient hoverboards out there as it doesn’t weigh more than 22 lbs, and you can carry it with ease. VEEKO hoverboard is powered by dual 250 Watts motors and can shift bodies of up to 225 lbs effortlessly. This hoverboard can reach a maximum speed of 6 MPH, making it the perfect choice for kids or beginners. Battery charging time is calculated at 2-3 hours, and the VEEKO hoverboard can reach up to 12 miles per single charge. The bright LED lights of this board are great for darker conditions. Another feature many users praise is the auto shut-off option which enables you to preserve battery life. Founded in 2013, TOMOLOO is among the pioneers of electric hoverboard manufacturing and an inevitable addition to any best hoverboard brands list. All TOMOLOO hoverboards are certified for safety, high-quality and impeccable performance. They keep on developing the latest technology thus improving their products and giving customers the best riding experience. The TOMOLOO hoverboard delivers the smoothest and most stable riding experience thanks to the professional gyroscopes, acceleration sensors, and top-notch motherboard. It is designed with its own invention patent which provides extra safety and ease of use. This hoverboard can reach a maximum speed of 10 MPH delivered by dual 300 Watts silent motors, and it can offer a 12 miles nonstop ride. As for extra features, the TOMOLOO hoverboard comes with Bluetooth for exclusive music playback and RGB LED lights which you won’t feel like you are overpaying for, seeing as this hoverboard is not on the pricier side. Moreover, the self-balancing scooter by TOMOLOO is waterproof making it the perfect get-around transportation device for all weather conditions. The hoverboards currently available generally weigh approximately 25 lbs. However, there are bigger hoverboards that come at a higher weight which is a con in regards to the ability to carry them around when needed. On the other hand, hoverboards that weight more are usually able to produce more power, can run longer, and reach higher speeds. Majority of the hoverboards can reach a speed of 6 to 10 MPH. The speed is usually dependant on the wheel size, motor power, and other unique features. The actual speed of the hoverboards also varies based on the weight of the load. The longer the battery life, the further points you’ll get to reach. Most of the hoverboards can handle up to an hour of riding time without any issues since the latest boards come with the best batteries. 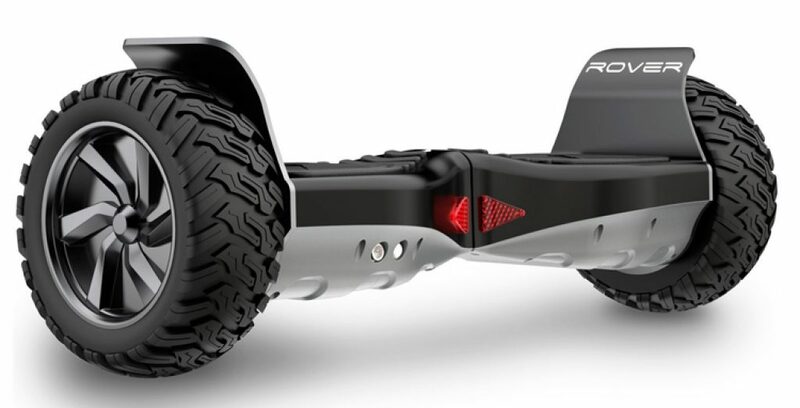 How long the battery will last also depends on the terrain you’re riding your hoverboard on. The maximum range a hoverboard can reach per single charge is between 6 to 12 miles. Of course, before deciding on which is the right board for you, you need to have a clear vision about the distance you’re trying to reach. If the hoverboard is no more than a toy for you or your little one, a 6 miles max range is just enough. One of the most important things you need to consider before deciding what is the best hoverboard for you is your your current skill level. As there are experienced and inexperienced riders among us, there are boards for a different level of skills too. For kids and beginners, boards that can’t develop fast speeds, as well as boards that are extra safe and light-weight are the right choice. Pro riders with a background in riding can handle pretty much any hoverboard. 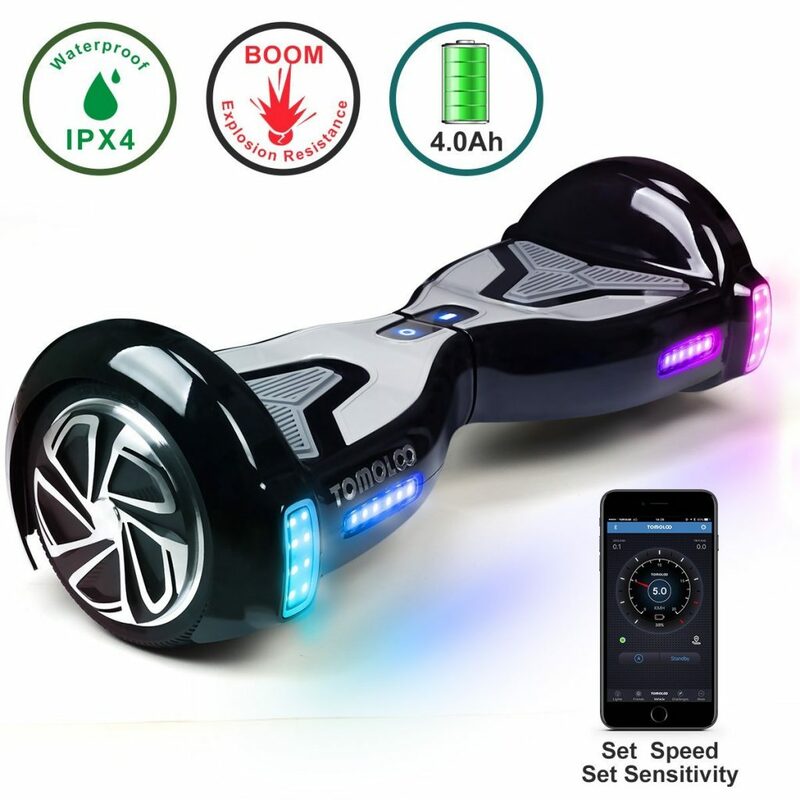 The overall performance of the hoverboard is non-dependant on extras such as Bluetooth connectivity or LED lights. However, it is way cooler to ride while blasting music on your Bluetooth speakers, or going for a night ride which would be impossible without the bright LED lights. Today almost any hoverboard comes with unique extras. Possibly the most considered factor in the equation is the price. Luckily, there are hoverboards on the market made to fit everyone’s budget. You can get a hoverboard for under $200 or over $600, and the best part is that even the cheaper self-balancing scooters have a lot to offer. Now that you know all about the features that make the best hoverboard, Amazon has a plethora of options you can choose from. Ultimately, you can always opt for one of the Groupon coupons and deals to make additional savings. First, there were bikes, then came roller skates and rollerblades, followed by skateboards all the way to kick scooters; those were the toys that marked our childhood. Although we did grow up, we’ve never actually grown out of the habit to take a ride every now and then. What was once considered only as a means of entertainment is nowadays a regular means of transportation. As we live in the 21st century, it’s no surprise that we are offered a self-transporting device in the form of a board that rides on its own – the majestic hoverboard. The best hoverboard brands mentioned above earned the title of being the best for the hoverboards they produce. Extraordinary performance, high-quality, top safety and unique features are implied for any self-balancing scooter these brands manufacture.